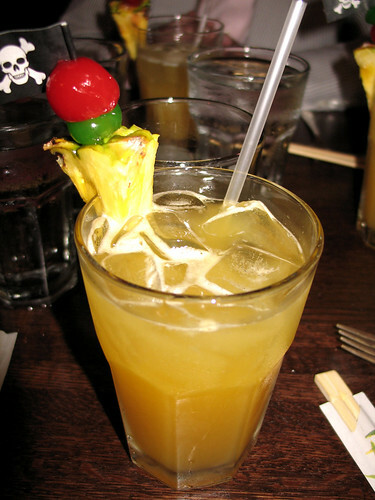 Looka!» Blog Archive » The Tiki-licious Luau Spirited Dinner! The Tiki-licious Luau Spirited Dinner! One of the best and most-anticipated events during Tales of the Cocktail is the Spirited Dinners, which take place in about 20 restaurants around the city, on the same night, at the same time. The restaurant’s chef will work out a special prix-fixe menu, and one or more renowned mixologists / bartenders / bar chefs / what have you will work with the chef to create cocktail pairings to go along with each dish. It tends to be an amazing burst of creativity both in the kitchen and behind the stick, and is invariably tons of fun. This was one of those times where we wished for the power of bilocation, or one of sf author David Brin’s “kiln people” from his novel of the same title, in which we could send a replica of ourselves to go do something we were unwilling or unable to do, then downloads its memories into our own heads. Alas, the technology has yet to catch up (that’ll be great for Jazzfest conflicts too), so we resolved to take an extra close look at what Chef Chris would be doing Spirited Dinner-wise in 2008. As it turned out, Chris was planning a Tiki-themed dinner along with the ever-stupendous Jeff “Beachbum” Berry, world’s foremost authority on tiki and tropical cocktails, and Wayne Curtis, author of And A Bottle of Rum: A History of the New World in Ten Cocktails, one of my favorite books last year. 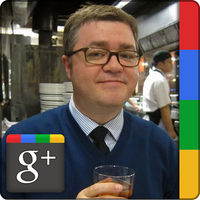 (Jeff’s latest, Sippin’ Safari, was one of my other favorites.) This was a triple-threat combination that was not to be missed, and although the Commander’s dinner looked pretty good, it was pretty much a foregone concluson that we’d finally make it to the Delachaise for a Spirited Dinner this year. There were a series of complications, though. First off, just a couple of weeks before the dinner, Chris left his position at The Delachaise. (Eek.) 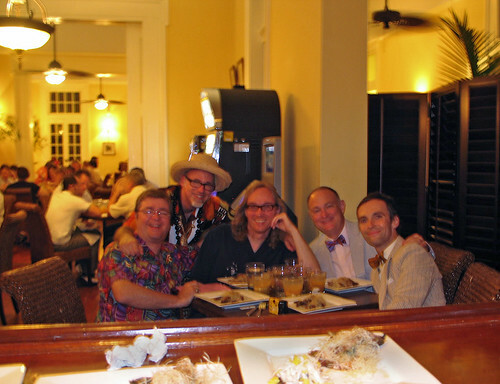 This turned out to be a blessing in disguise, for the dinner at least, although not so much for Chris’ gig and income at the moment — the dinner was moved to a place in the Bywater called The Country Club. It was perfect; the kitchen is run by Chef Miles Prescott, a friend of Chris’ who had been his sous chef at The Delachaise, and the whole place is friendly and spacious with just the atmosphere we needed for the dinner’s theme. The next complication was not so perfect. You may recall from the Tales recapping I’ve been doing that Thursday, July 17, was a pretty big day in which not everything went as it should have; to wit, I did not avail myself of the use of the spit bucket at all the spirits tasting seminars we attended that day. Let’s recap the running tally, shall we? 10:30am to noon with Paul Pacult, and six Macallan single malt Scotches. 12:30 to 2pm, Juniperlooza! with tastes of 9 gins, one sloe gin, and four small 2-ounce cocktails utilizing various gins. 2:30 to 4pm, tasting 10 French and Spanish brandies, plus three 2-ounce cocktails. 5 to 7pm, the Cocktail Hour event, featuring about 30 mixologists dishing out 2-ounce or so tastes of their concoctions. I remember getting one from Wondrich and probably two more. THEN we headed out for the Tiki dinner, where five utterly fantastic (yet LARGE) tropical cocktails were served. The dinner was absolutely spectacular, as you’ll see in the following paragraphs. It was, actually, one of the most spectacular meals I’ve had in years, if not ever. I enjoyed every bit of it and had an immensely fun evening — that much I know. It’s just that … well … the details ended up being a bit hazy the next day, much to my near-infinite regret. So kittycats, we have a guest food pornographer today to help fill in the details. Wes is now going to make his Looka! debut, and as you’ll see he does a fantastic job recounting our stunning meal and the amazing drinks that went along with it. Jeff Berry was kind enough to offer to share the recipes with anyone who was there or at his seminars later on, and I thank him from the bottom of my liver for that. Chef Chris also wrote a wonderful, amazingly detailed post about his concepts for and execution of the meal which you simply must read in its entirety, especially if you were there (and from which I will quote a few passages amidst Wes’ reminiscences). Starting below, the voice will be Wesly’s, with my photographs and addenda added by yours truly appearing in [bracketed italics]. And now we switch you live and direct to The Country Club at 634 Louisa Street … take it away, Wes! Our group arrived at The Country Club on Louisa Street on time — not bad for a bunch of drunks, although in fairness it was but a short cab ride from the Monteleone Hotel. It was just dusk, and against the slowly darkening sky the front windows of the club shone in bright welcome. The cool air inside washed over us as we opened the front door — there may be no more delicious sensation than that of air conditioning escaping past you into a Southern summer evening. A few steps more and we were in Havana. 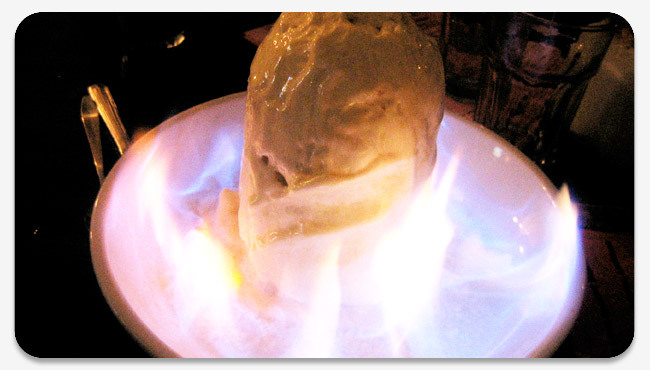 Is there any sound finer than the incendiary clatter of ice in a cocktail shaker, or the delicate clink of ice as it falls into a glass? I think not. 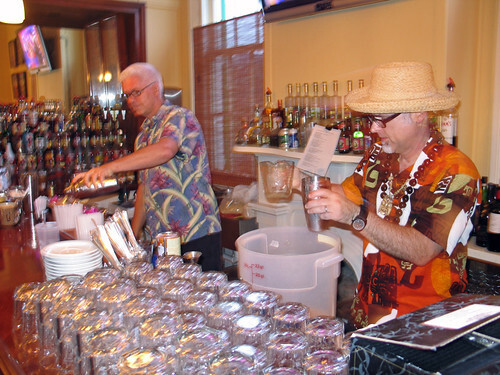 Our tireless bartenders Jeff “Beachbum” Berry and Wayne Curtis were already hard at work behind the bar when we walked in. A good thing, too, as their job for the evening entailed preparation of five different, elaborate tropical cocktails for a discerning crowd of 60. That’s a lot of mixing, a lot of high standards, and a lot of liquor. Yo ho ho indeed. Southern hospitality may seem a cliché to some, but in truth it’s a long-standing tradition with its heart unarguably in the right place. Perhaps the first act of hospitality is that of welcome, and to my mind you’ll find little more welcoming than a cocktail upon arrival. If that cocktail happens to be named after a childhood icon of grace, beauty and style, so much the better. 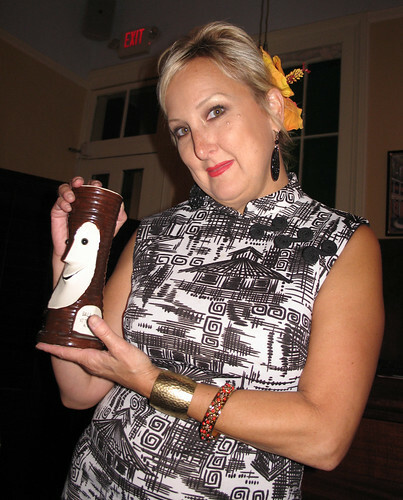 i.e., by Jeanne Vidrine, the Tiki Queen of New Orleans — so much the better. Tiki ceviche, The Green Hornet, and Lafcadio’s Sushi. What better way to kick off a tropical meal than with fresh fish? 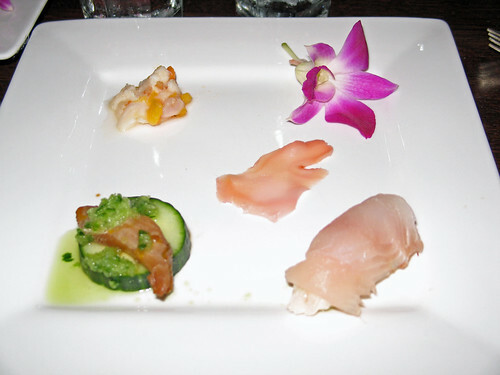 I love sushi and sashimi anyway, and although it may have been dichotomous to add ceviche to the mix, it was a brilliant choice by Chef Chris and the result was harmony on the plate. Gorgeous fish, immaculately prepared, elegantly presented, and apparently simple — but this was a deception of the best kind; read Chris’ preparation notes for a peek into the secret life of a chef who suffers from the dread curse of Inspiration. All three bite-sized pieces of heaven were completely delicious, but for me the Tiki ceviche was the stand-out, a surprising bloom of tropical fruit, sweet and tart together again. Simply beautiful. The smooth cucumber granita made for a perfect palate cleanser before moving on, and the little burst of Serrano chile heat playfully admonished us to keep our wits about us. Some of us managed to do so. Next was another plate of small tastes. 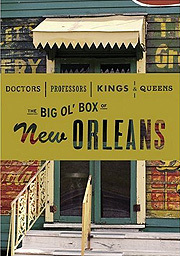 If you’ve ever visited New Orleans, chances are you’ve had jumbo Louisiana shrimp, but never like this. 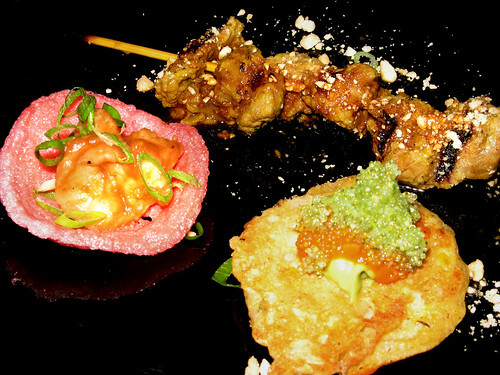 The tamarind sauce was bright and sharp, and the pink Vietnamese rice cracker not only added a splash of color to the plate and made for great textural contrast with the shrimp. It also reminded me of some of our favorite banh mi places in Los Angeles, where you can buy snacks like shrimp-flavored rice chips in a bag. The beef satay resembled a dear and familiar friend, but the sauce turned out to be vastly different from the usual (and half-expected, shame on me) peanut sauce. Instead it was sweet, tart, a bit fiery — and perfectly delightful. 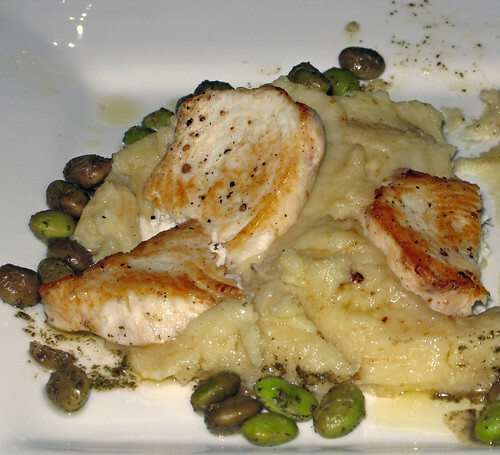 The johnnycake was a variation on a dish of Chris’ that we had enjoyed previously. The hearty, crusty cake with rich crab and sweet corn was intact as I remembered it, but brought to different life with smooth avocado and romesco sauce and the double pop of wasabi-flavored flying fish roe. Holy crap! I couldn’t help but laugh aloud. I had been looking forward to the “Wahine Shrimp” ever since I had first read its description on the Spirited Dinners menu announcement. This is quite simply a fabulous dish, one of the best tastes I’ve ever had in my mouth, and one I would very much like to have in my mouth again. I think it was also the most whimsical and visually delightful of the evening’s many offerings, and that’s a tough contest indeed. “Barbecue shrimp” is of course a classic New Orleans dish, and although very different this is a loving nod to that classic. But if the idea of a shrimp wearing a grass skirt doesn’t make you think of smiling dusky maidens dancing slowly on sunset beaches, then you may need a vacation. Badly. Another fantastic set of flavor and texture contrasts, and just fun to eat. 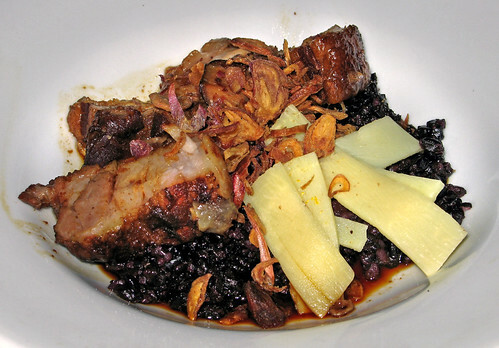 with “Forbidden” sticky black rice and bamboo shoots. Mmm, pupusa. We love pupusas, and we love the big plastic jug of slaw that’s served with them at our favorite local Salvadoran restaurant, Las Cazuelas. With this meatless pupusa, Chris provided a perfect counterpoint to the other dishes in this selection. It was perfectly grilled, crispy on the outside but soft inside, and the filling of black bean and banana blossom was silky and piping hot. 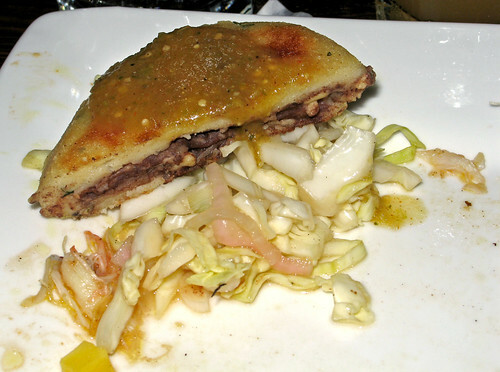 The slaw was authentically Salvadoran, cool and crisp and tart. Unfortunately there’s no picture of the next food item, which is a shame as it was highly photogenic. I suspect there’s a good reason for this, which we may delve into later on. 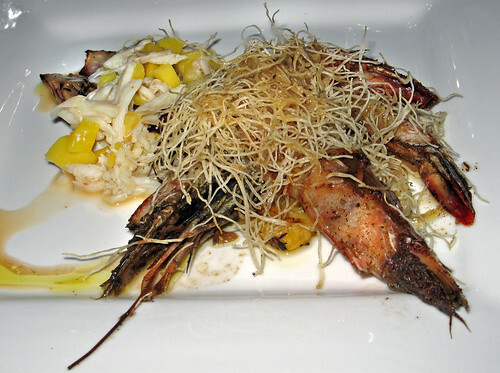 In any case, the “Outrigger Canoe” was constructed of grilled red endive and filled with a blend of jumbo lump crabmeat and young jackfruit. As I recall, Chris mentioned that he had previously done this dish using mango rather than jackfruit. Soft, ripe mango would have been lovely, but I think the brightness of the jackfruit worked extremely well against the mellow, full-mouth richness of the crab. The slight bitterness of the endive was nicely mellowed by the grilling, so rather than standing out in stark contrast it worked to bring the other flavors together. Hmm, I’m sensing a motif here — there’s no picture of the Pamplemousse Punch, either. [Rick got a shot of it, though.] What, you may well be wondering, is up with that? I think it’s time for me to ‘fess up for Chuck: by this point, he was well and truly tanked, although he didn’t quite realize it himself. I’ll let him explain to you himself How I Got To This Sorry State, but the simple truth is that he was sloshed, smashed, three sheets to the wind. He was very drunk indeed. He seemed to enjoy his punch all the same, and well he should have done. 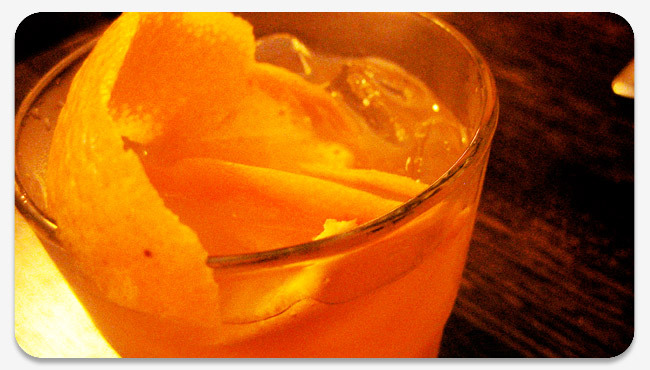 The mellow but slightly fiery spiced rum was complemented perfectly by the clean orange of the Creole Shrubb, and the bitter grapefruit and herbal astringency of the Herbsaint combined in a beautifully balanced punch. New Orleans has been described as the northernmost city in the Caribbean, and this drink is the perfect embodiment of that deeply romantic idea. At this point, Chris cleverly slipped in another vegetarian dish, a trilogy of tomatoes. I love alternating meatless dishes with meat, as this lends an enjoyable variety and helps me to feel less gluttonous (although this last bit may be only in my head). This was another dish shared by the table, and it didn’t last long, so all things considered I’m impressed that there’s a photo proving it was ever there. I can’t say enough about how crazy and crazy-good this dish was — the green tomatoes are a nod to another classic Southern dish, but crusted with macadamia nuts? Damn, Chris! The flavor of wattleseed in the sauce (reminiscent of coffee) and the inspired blue-cheese-and-durian ice cream (two stinky tastes that taste great together) should have left this dish feeling literally as well as metaphorically “all over the map,” yet somehow did not. Outstanding. Chris: “Besides the Trio that started the dinner, the most complicated dish of the night was the Green Zebra Goes to Oz. 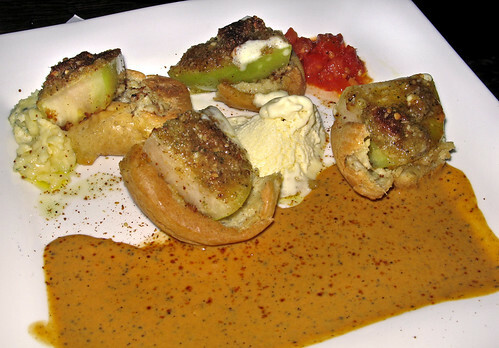 We had to settle for regular green tomatoes, but the reference in the name was that we were taking fried green tomatoes (we were hoping for juicy heirloom Green Zebra tomatoes…) on a culinary tour of Australia, or Oz. Macadamia nuts are an Australian product, though it took Hawaiians to successfully market them to the world, and macadamias are related to candlenuts, which are so rich in fats that they literally served as a source of energy for folks in Indonesia, Malaysia, and SE Asia. You cannot eat candlenuts raw, but macadamias are more accessible. “So we ‘pannée’ the tomatoes, which is a technique I first imagined on a riff for Tomatoes Oscar, where I crusted yellow tomatoes in a pistachio, olive oil, and breadcrumb crust on one side, then topped the tomatoes with “Oscar” companions of crabmeat and asparagus, and made a tangerine aïoli that had a very similar texture to hollandaise, but was more stable and cirtusy vibrant. In this Oz dish, a chunky tomato chutney was a reminder that ketchup really has its roots in the Spice Islands surrounding Australia, just as a note in the conversation of exotic origins of so many of our basic foods. “The Australian flavors were in the spices: bush tomato profiteroles, which I probably needed more of the bush tomato spice; lemon myrtle oil (a simple infusion of olive oil), and wattleseed, a coffee flavored spice, that I wound up adding to a molee, which I researched in James Oesland’s excellent book Cradle of Flavor. Initially, I was thinking of making a mole sauce using the wattleseed kinda like chocolate. Then I read about the rendang-like sauce, named molee, featuring coconut milk cooked long and slow, so I went in that direction but kept my roasted red pepper so it was a hybrid mutant … but tasted good. 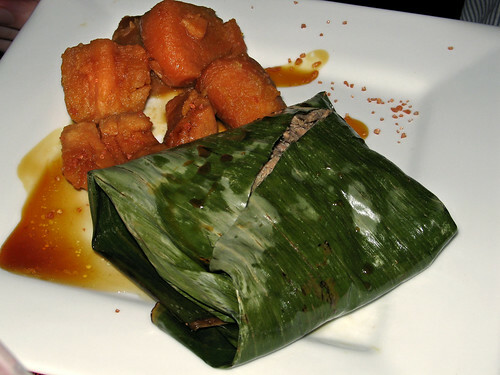 Kalua pork wrapped in banana leaves, with sweet potatoes, Steen’s cane syrup and Hawaiian sea salt. We’re huge fans of L & L Hawaiian Barbecue, one of which just opened up in our neighborhood. More to the point, we’re huge fans of Kalua Pork, which L & L does very well. (We’re thinking of buying a big catering pan of just the Kalua Pork so we can take it home, freeze it and eat it over time with our own side dishes. The side dishes at L & L are authentic, but it’s a lot of starch for me … however, I digress.). The simply seasoned shredded pork inside the banana leaves was falling apart, the fat almost completely rendered — you’re soaking in it! 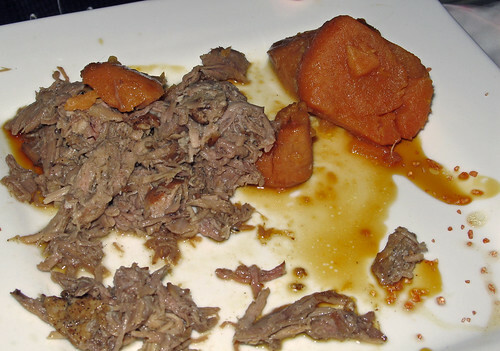 — and the Steen’s-drenched sweet potatoes simply melted on the tongue. Another beautiful study in contrast of texture and flavor, which in case I haven’t made clear is something I esteem and enjoy greatly as it makes food actually interesting rather than just good-tasting. 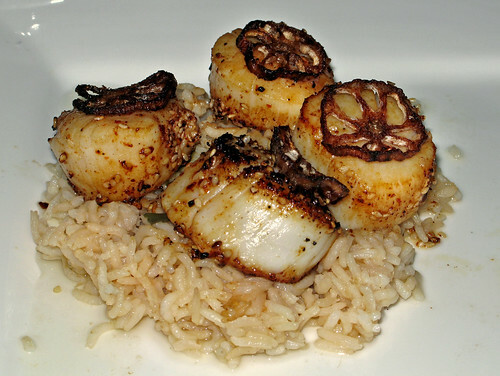 Scallops are one of my mom’s favorite things, and I like to imagine that I got my love of them from her. They’re so subtly flavored, I think it’s best not to go with very strong accompanying flavors or an overly complex preparation, else you risk overwhelming them and making them seem bland. The bed of jasmine rice infused with green tea provided a foundation of distinctive but restrained flavors that accented but did not overcome the scallops, and the togarishi crust added a bit of heat that I might not have expected but worked very well. The fried lotus root chips that topped the scallops added a nice crunch and made for a striking presentation. You’ll look long and hard to find a New Orleans restaurant that doesn’t have Gulf Fish Meunière on the menu. And why not? It’s not only a classic — it’s true comfort food. Chris must have had about a ton of fun coming up with this variation on the theme. The fish here is pan-roasted wahoo, which must have been fun, by which I mean next to impossible, for a crowd this size. It was perfectly cooked: moist, flaky, beautifully seared. The meunière (brown butter) sauce put Old Fashioneds right on the plate, drenched as it was in Bourbon, tangerine juice, maraschino liqueur and Fee Bros. Whiskey Barrel Aged Bitters. Although I don’t remember this being listed on the menu, Chris mentioned on his blog that he finished the sauce with Bittermen’s Tiki Bitters, which took us full circle back to the welcoming cocktail. Just mind-bogglingly good. **** YOUNG COCONUT. Young coconut meat is very soft, and delicious after soaking in rum and lime — serve with a spoon! 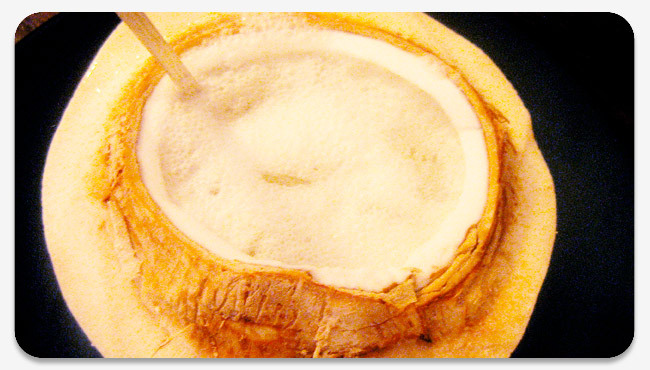 To prepare young coconut: Remove the top of the coconut with a large knife. (Instructions at http://www.rawguru.com/html/openyoungcoconut.html). 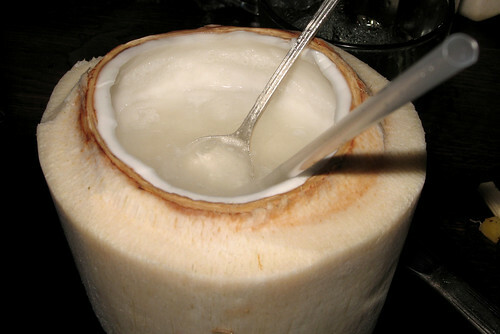 Drain the coconut water into a container. Set aside coconut water and empty coconut shell. I knew something was up when, instead of bringing plated desserts to our tables, kitchen staff began rolling out several carts that reminded me somewhat of those used for tableside preparation of Bananas Foster. As it turned out, I wasn’t too far off. The desserts were towering meringues concealing roasted pineapple-crystallized ginger cake, along with macadamia nut and Hawaiian ginger honey ice cream. And then, in true crowd-pleasing fashion, the lights were lowered and the pool of 151-proof rum surrounding each meringue tower was set ablaze. The roar of approval from the crowd was deafening. You couldn’t get more 1950s-Tiki-riffic if you tried. The flavors were incredible, with nuts and fruit trading off, and the kick of ginger, and the teasing lure of rum. A truly appropriate and spectacularly big finish. Chris: “Dessert was Gargantuan, funny, and a showstopper. We encountered a slight technical glitch in that it took more layers, and time, to properly set the gigantic Tiki insides of the Baked Hawaii to our desired height, so I didn’t have time to carve Moai, or the New Orleans icon of Bali Ha’i into the meringues. There were three layers of cake and ice cream, and each layer had to freeze before we could add the next. Nonetheless, the rather phallic, huge, mysterious shapes went out to the darkened dining room, doused in 151 rum, and with an aura of blue flame pooled at their base. 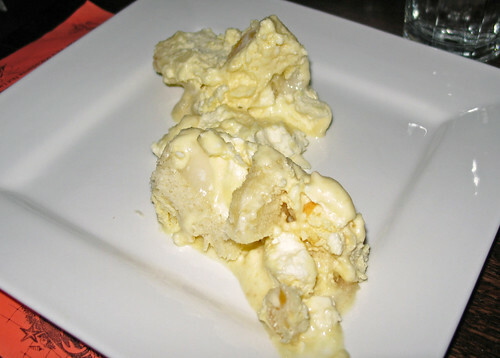 The macadamia semifreddo perfectly matched the dessert drink, and the roasted pineapple and crystaliized ginger white cake layers added more tropicalia. I went with a meringue buttercream, which is more stable and easier to carve than straight meringue, so I feel confident now that the next time I present Baked Hawaii all the technical worries have been completely solved! I showed the message to Marleigh, who said, “We should go up and get him, shouldn’t we?” We did go up and found him in the middle of a very loud, very crowded room. He was fine, having a very good time, and even remembered (or claimed to remember) sending me the text message. He was quite agreeable when I suggested that maybe it was time to go. We walked back to our hotel; I didn’t let him cross the street by himself. I probably should have made him drink more water, but I think by then he mostly needed sleep. He slept very soundly, for a long time.